A dead car battery after work has me skidding and sliding to make the Bloom Day deadline. Some of the new plants I ordered for spring became candidates for March Bloom Day literally right out of the box. 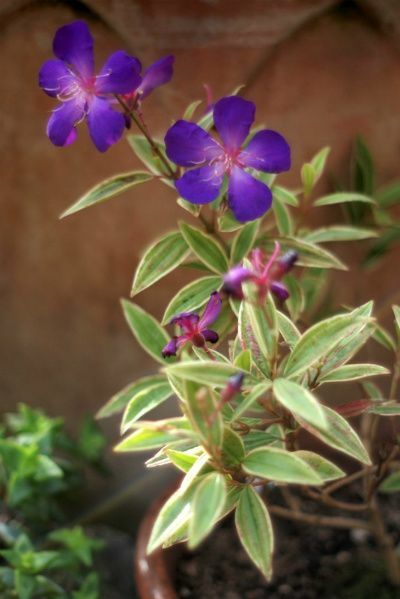 Like this Tibouchina granulosa ‘Gibraltar’ from Plant Delights. This photo was taken the day after it arrived and was unpacked. 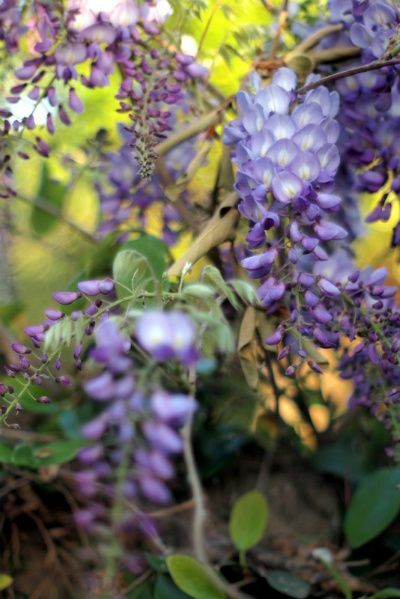 Every spring this wisteria surges over the fence from a neighbor’s property, an invader in the southeast corner of the back garden quietly determined to throttle my smoke tree in its tendrils. Something borrowed and blue (okay, bluish-lilac) to admire when in bloom, but I’m always grateful that it’s somebody else’s problem the rest of the year. The more I hack it back off our fence, the better it blooms. 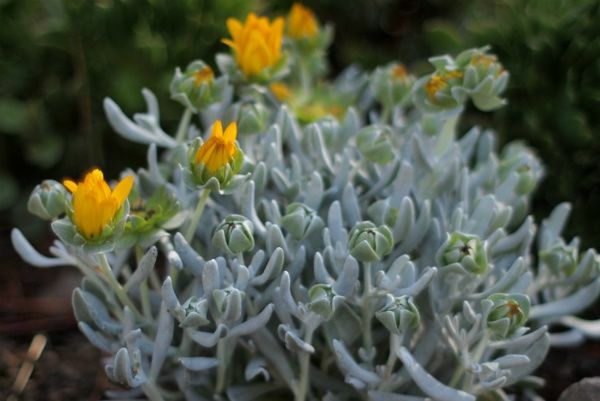 Just brought this one home last weekend, a Proven Winner’s selection, Didelta carnosa â€˜Dawn.â€™ The radioactive chrome yellow daisies must be endured for a brief time, when things will hopefully quiet down to just some fine-looking succulent, silvery leaves and chartreuse bracts. Bought on a whim but looks promising. 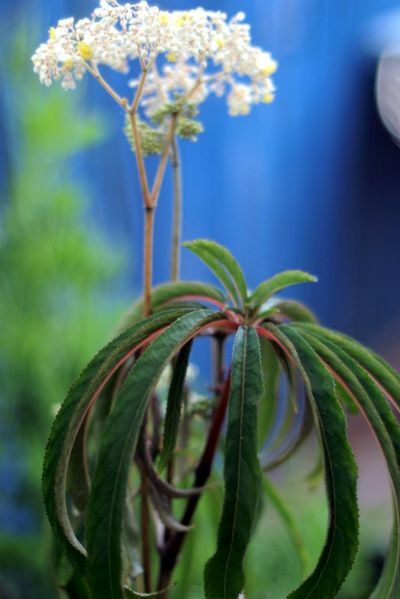 Begonia luxurians has been blooming the past few months, though I never think to grab a photo for Bloom Day. 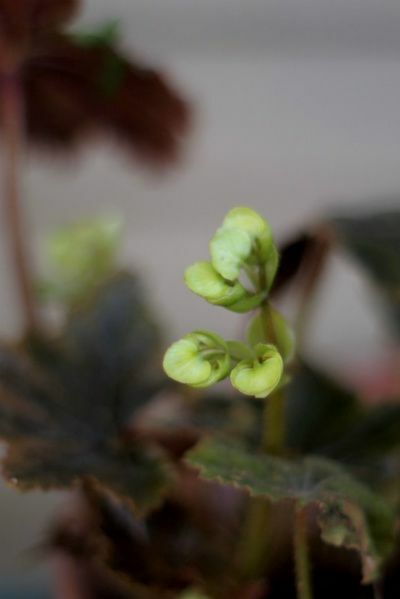 Always a few mystery plants in bloom, like this unnamed, green-flowered begonia just in time for St. Patrick’s Day. 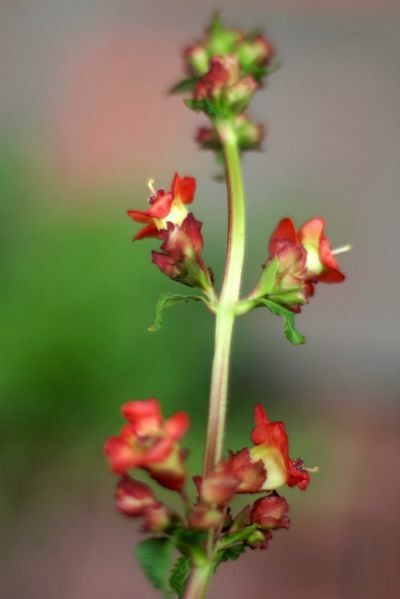 Scrophularia calliantha from Annie’s Annuals & Perennials planted in fall started blooming late February. 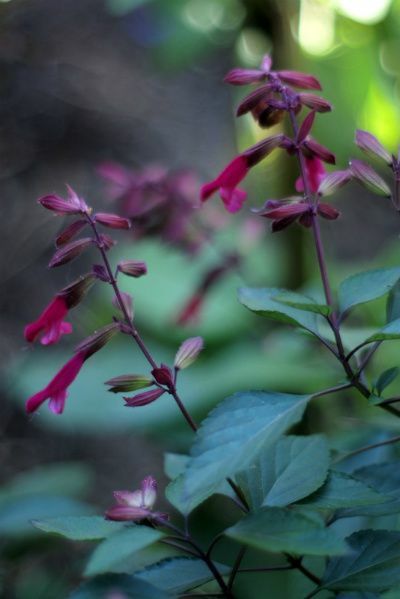 A big, boragey, salvia-esque plant with exacting water needs even in a large container. 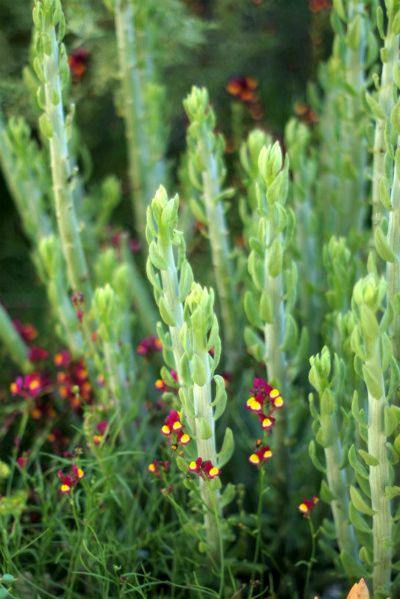 The annual toadflax, Linaria reticulata, a good choice for a zone 10 winter, seen here with the spears of Senecio anteuphorbium. 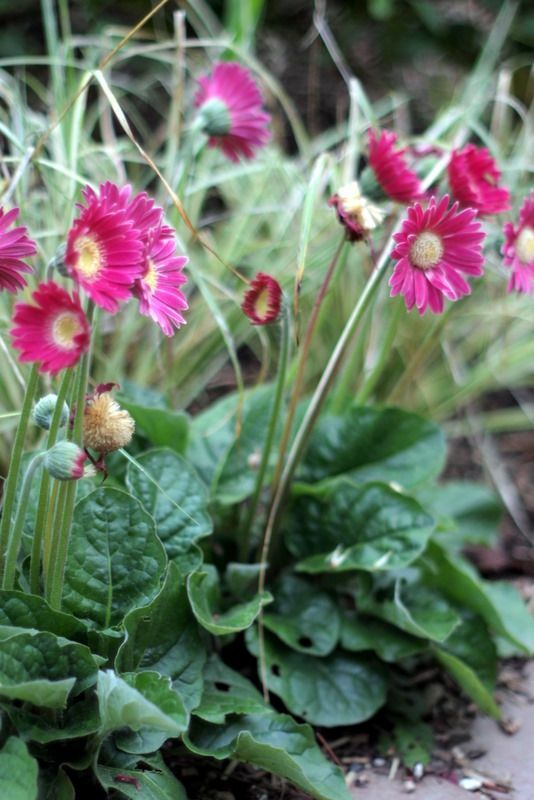 The ‘Drakensberg Carmine’ gerberas have been prodigious bloomers over the winter. 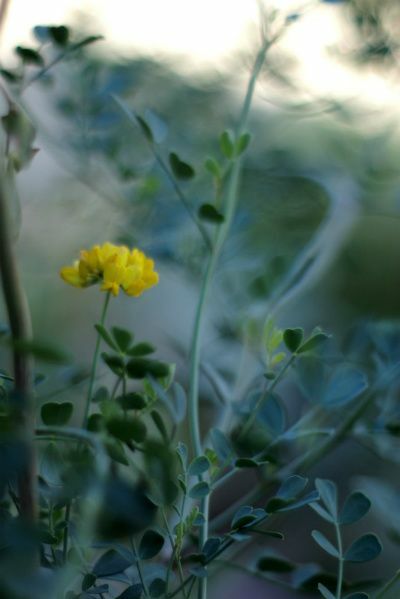 March will probably see the last of the coronilla blooms. Thanks as always to Carol at May Dreams Gardens for hosting Bloom Day on the 15th of every month. 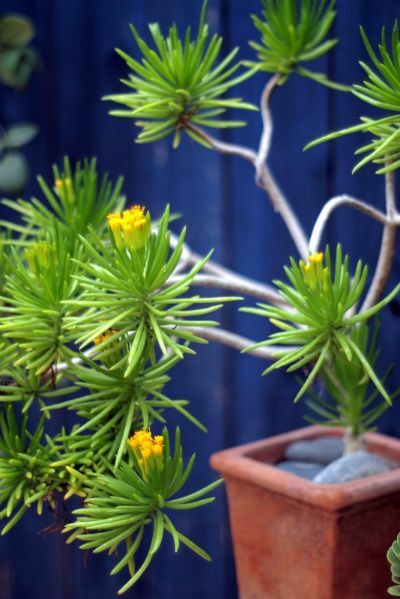 This entry was posted in Bloom Day, Plant Portraits, succulents and tagged angelica pachycarpa, Coronilla valentina subsp. glauca, Didelta carnosa 'Dawn', Gerbera 'Drakensberg Carmine', Linaria reticulata, Salvia 'Wendy Wish', Scrophularia calliantha, Senecio anteuphorbium, Tibouchina granulosa 'Gibraltar'. Bookmark the permalink. I love looking at all these colorful spring flowers. Only snowdrops here. Plants Delight is an amazing nursery. I had the pleasure to visit it a few years ago and all of the purchases I made are still going strong! Your blooms are lovely–thanks for sharing! 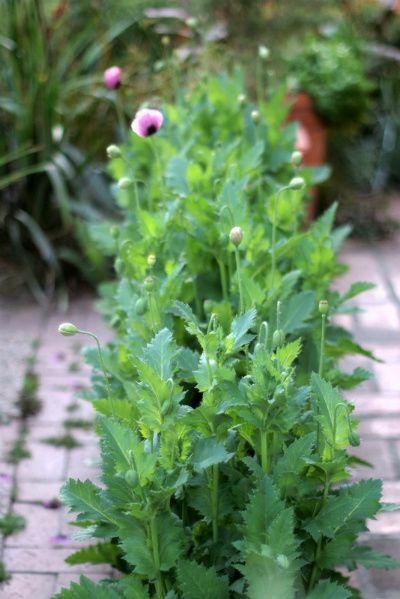 “Bought on a whim but looks promising”…the words of a true plant addict. Last year when I bought (my now dead) Begonia luxurians the cashier went on and on about how beautiful the blooms were. When I told her I didn’t care if it bloomed, I loved it for the foliage, she looked so confused. CW, I didn’t think “only” and “snowdrops” could exist in the same sentence! I think I could easily succumb to snowdrop-mania. I love seeing photos of them on blogs. Julie — yes, PD is amazing, with interesting plants always in the pipeline. And I though I didn’t emphasize the point enough, I was trying to show what an excellent packing job they do too. Loree, yes, that’d be my mantra. So sorry you lost your luxurians. 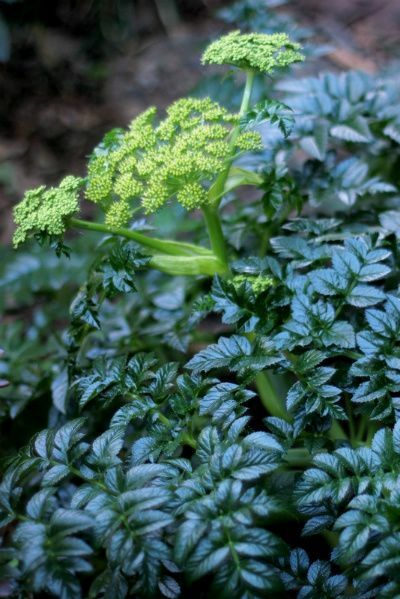 I think I’ve blogged before how the best one I had ever seen was on a Portland garden tour, so I know they love your spring/summers. Wonderful blooms but that first one, with the variegated foliage, ooh, la, la! I’ve tried growing the species but of course winter did it in. Great photos!